200E79’s design reinterprets the heritage of Upper East Side architecture, integrating classic and traditional elements with a modern sensibility. 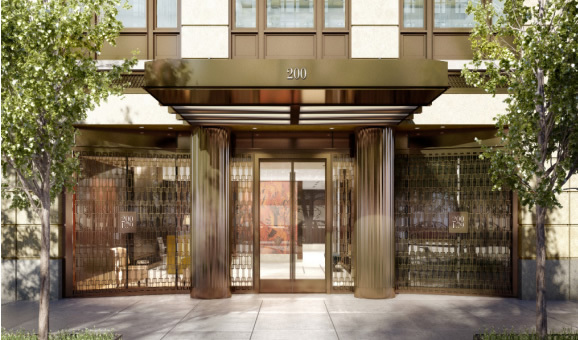 With an elegant facade comprised of limestone, bronze, and aluminum, complemented by large windows, 200E79 takes advantage of its premium corner location to create a distinctive yet contextual mark on the Upper East Side streetscape. 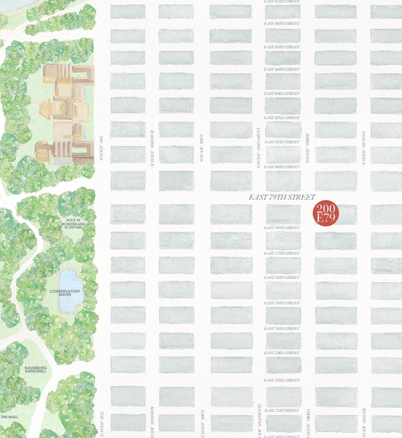 Located between the green expanses of Central Park and the charming promenades of the East River, 200E79’s proximity to an exceptional array of boutiques, restaurants, and cultural destinations, coupled with its exquisite architecture, epitomizes classic contemporary Upper East Side living. Framed by a custom bronze screen and canopy, the striking entryway is recessed from the streetscape, providing a welcoming and private homecoming. 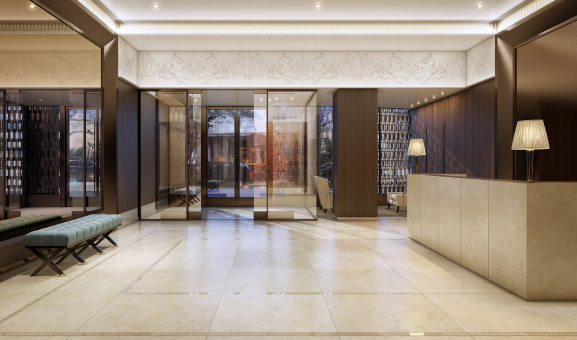 The lobby was designed to evoke old world elegance executed in a modern vernacular, featuring Sapele wood paneled walls that are accented by bronze mirrors, and a gracefully patterned light marble floor. Situated between the delightful expanses of Central Park and the charming promenades of the East River, 200E79 is at the very center of the Upper East Side, in a neighborhood of exceptional boutiques, restaurants and cultural destinations. 200E79 will be staffed by a 24 hour doorman, a concierge, a porter and a live-in Resident Manager. With only 39 residences, an exceptional level of service will be offered. 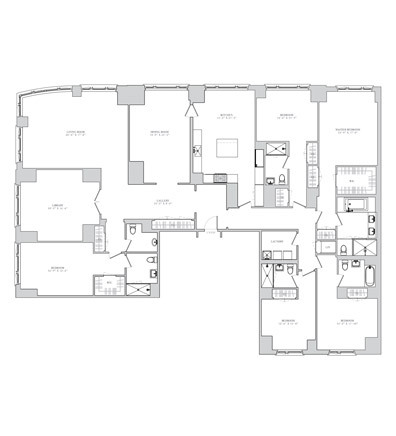 Designed with modern residential needs in mind, 200E79 combines the generous layouts of classic pre-war planning, including foyers, bedroom corridors, and separate bedroom wings, with contemporary convenience, creating an open and inviting atmosphere. Select units (on the top five floors on the building) have private outdoor terraces. Adjacent to the Terrace Room and with a pergola to provide shade and privacy, the Terrace is a respite from the city rush and a place to read the paper or just get away from it all and be surrounded by greenery. 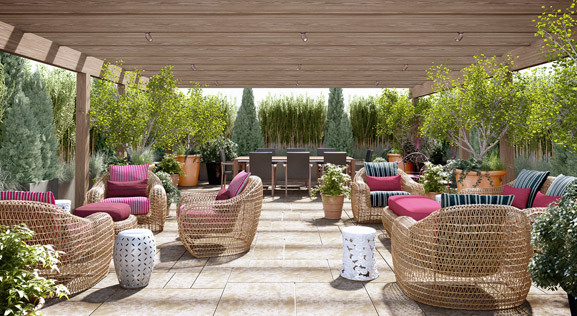 The landscaped Terrace will have seating as well as a dining table. With its cozy seating alcoves, hidden oversized flat screen television, and cerused oak paneling, the Terrace Room is a perfect spot for both relaxing and entertaining. "It is a building of its time, a contemporary classic. This is a building that tries to take the best from the past, the great buildings of new york city, and integrates it into something contemporary and of its time." The fitness center is outfitted with state of the art equipment allowing owners to exercise in the comfort of their own home. A private studio is available to reserve for personal training, yoga and pilates sessions. A ping pong table, all purpose court with adjustable basketball hoop, and mirrored dance area complete with ballet barre furnish an all-ages gymnasium. Bleacher-style seating will be available. Welcome to 200 E 79. This contemporary classic residential building is positioned in one of the most sought after locations for condo apartment buildings in the Upper East Side of New York City. Situated between Central Park and the promenades of the East River, 200E79 is in close proximity to boutiques, restaurants and cultural destinations. 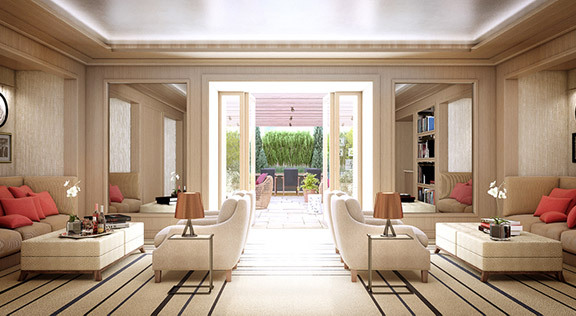 The 39 luxury apartments of 200E79 have been carefully designed to be open, airy and elegant. There are several floor plan options for apartments that range from three to five bedrooms and 2,215 to 5,100 square feet of living space. The floor plans of the available apartments for sale can be viewed and downloaded from our website. The building has been designed with a range of amenities for comfort, convenience and luxury living. A beautifully landscaped terrace surrounds residents in lush greenery and provides a respite from the rush of the city. Adjacent to this, the terrace room provides cozy seating, an oversized flat screen television and space for entertaining. 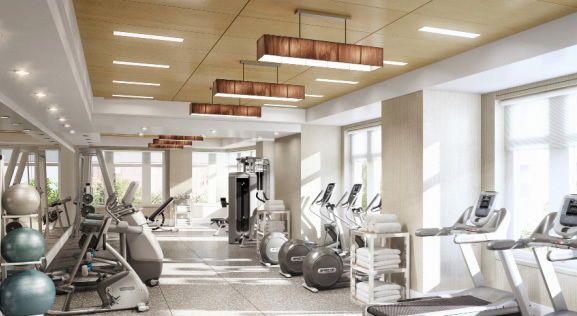 The fitness center contains state of the art equipment for exercise and a private studio for yoga, Pilates, and personal training. 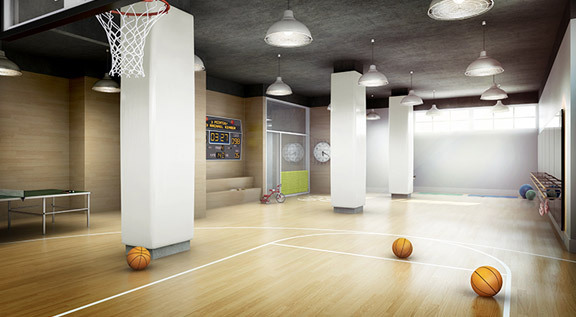 The gymnasium features an all-purpose court with basketball hoop, ping pong table, a mirrored dance area, and more. 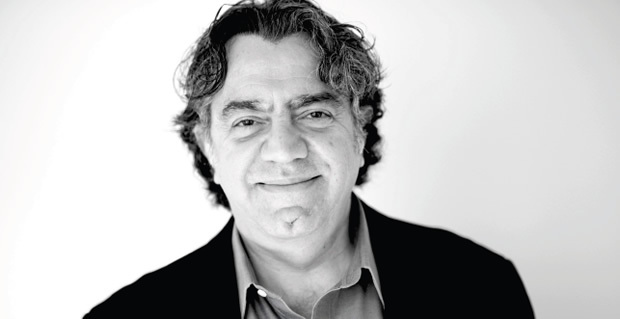 Owners of our condos enjoy outstanding service. 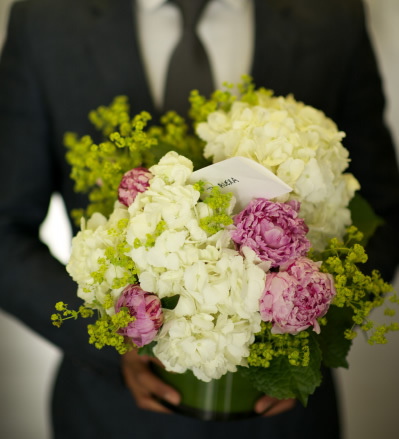 The staff includes a 24 hour doorman, a concierge, a porter, and a live in resident manager who provides an unsurpassed level of service to owners. Please browse our website to find more information about the building, location, amenities, and view floor plans of condos for sale at 200E79. All photographs and artist's renderings are for representational and illustrative purposes only and subject to variances. 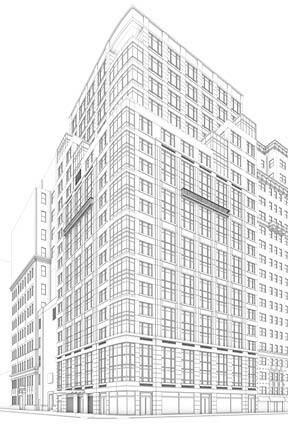 Not all items listed in artist's renderings are included in unit purchase. Any photographs that have been given to purchasers have been given for the purpose of providing an understanding of views which a Purchaser may have from certain Units. Sponsor, however, cannot guarantee the views from any specific Unit nor can Sponsor warrant whether any such views will be modified based upon future construction or demolition in the area or the addition of mechanical equipment on rooftops. In addition, certain of the Central Park and neighborhood scenes are not views taken from the Building or any Unit. In no event will the presence of any furniture, furnishings, equipment, decorations or landscaping in any model apartment (or any Common Elements appurtenant thereto) or in any advertisements imply or represent that any Residential Unit or Common Element will contain such furniture, furnishings, equipment, decorations or landscaping upon delivery of the Residential Unit to Purchaser unless Purchaser agrees to pay Sponsor an amount determined by Sponsor in addition to the purchase price for such Residential Unit. The artist representations and interior decorations, finishes, appliances and furnishings are provided for illustrative purposes only. Sponsor makes no representations or warranties except as may be set forth in the Offering Plan. The materials and finishes in the Condominium are described in the Offering Plan and are subject to modification as provided in the Offering Plan. All dimensions are approximate and subject to normal construction variances and tolerances. For exact dimensions, you should hire your own architect or engineer. All photographs and renderings are for artistic representation purposes only. The Sponsor makes no representations or warranties with respect to the Units, except as may be set forth in the Offering Plan. The complete offering terms are in an offering plan available from sponsor. File No. CD-12-0057.Sponsor: 200 East 79th Street LLC, 13-15 West 54th Street, NY, NY 10019.